I love my new Skoda Superb and especially its DSG, the Direct Shift Gearbox. This is an automatic gearbox with dubble dry clutch which means that it has two shafts, one with the gears 1, 3 and 5 and one with 2 and 4, and while you accelerate on gear 3 the other shaft shifts to gear 4 which is then ready when you reach the right speed. This is when the beautyful thing happens: the second shaft is enabled by its clutch simultaneously as the first shaft is disengaged. 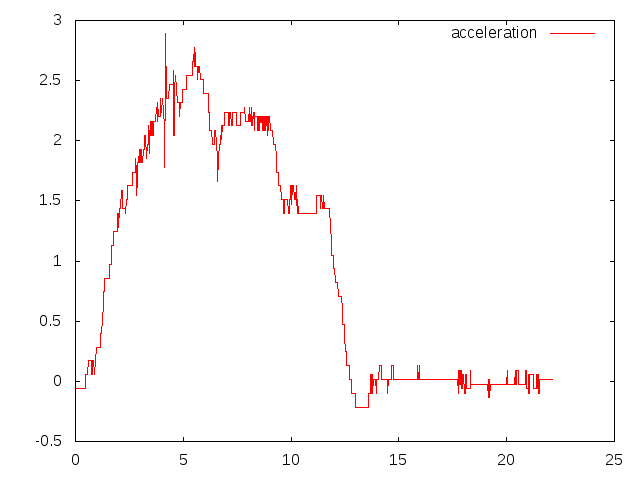 I've used my phone to measure the actual acceleration during a moderate, smooth acceleration from zero to 70 kph. The graph shows that there is a small drop in acceleration when the gearbox shifts, but it's very small.